Founded by ex-Getty Images CFO Lawrence Gould and former Getty Images Director of E-Commerce, Tom Donnelly, ImagePick is a new Royalty Free image service that intends to shift the tectonic plates of the stock industry from quantity back to quality. The ImagePick website has been designed with simplicity and ease-of-use in mind. Large numbers of thumbnails on a single search provide a fast and efficient way of finding the perfect image. It has partnered with the rights-holders of the finest image collections available including Corbis, Jupiterimages, Blend, Rubberball and Westend61. “We want every picture editor to take the ImagePick Challenge. We’re confident that when editors experience the results of an image search on ImagePick, they will wonder why they entertained mediocre image solutions for so long,” said ImagePick CEO Lawrence Gould. In this digital age, having a captivating social networking and online dating profiles mean a lot to millions of teens and young adults. Hence, having a perfect picture devoid of acne scars and pimples is a serious business. So serious that PicWash, a new photo-enhancement web services to the masses by making them easy to use and cost-effective, is bound to make a killing considering that many are as concerned with their “web appearance” as with their physical appearance. The companyâ€™s editors and graphic designers collaborate with a dermatologist and beauty industry consultants to help ensure that you look great and your picture looks its best – without making you look like a different person. The service is easy to use and cost effective. Users can upload photos to PicWash.com and request a PicWash for as little as $7 per photo, compared with $50, the average price of a professional photo touch up. Photos are returned in 48 hours via e-mail. 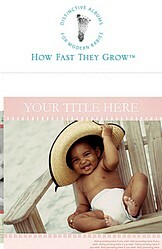 Aimed at parents who exclusively use digital cameras, How Fast They Grow is new all-digital baby book Website that allows quick creation of 12 by 12 inch pages using one’s own digital photos and journaling. Unlike commercial photo websites, the pages are ordered individually, not bound books, so that users can build their books over time. This new site developed its own unique rich-internet application, “Digi-Scrapbook”, in conjunction with Ecom Enterprises of Sunnyvale, CA. This patent-pending tool allows for real-time editing of pages, photos and text, while keeping the traditional look of a high-end scrapbook with details like layered text, quote boxes, and well-formatted photo collages. “There is an unspoken expectation that moms should chronicle their baby’s first year. Despite the current popularity of paper scrapbooking, the moms I know were disillusioned by the time commitment. It takes at least an hour to make one page and that doesn’t even take into account the time to buy the merchandise and print the right photos. My goal is a ‘Just Add Water’ solution to baby and child scrapbooking,” states founder Cathy Bennett. Google revealed yesterday through its blog some interesting new features for Picasa, its online photo storage and sharing service. 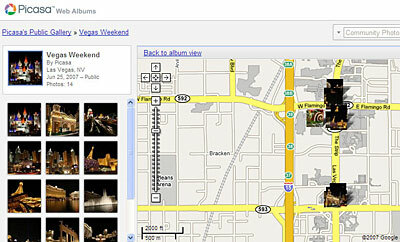 These features include integration with Google Maps and a mobile version of Picasa. The mobile version of Picasa lets you visit an optimized version which is viewable through your mobile device’s smaller screen. With it you can view your photo albums, download photos, view snapshots of others, post comments on those snapshots and make use of photo search to find pictures related to your query. Picasa is also being tied into Google Maps (and Earth). A new “Map My Photos” option will let you see where on a map you took your photos. These photos, when shared, can also have their location revealed to others who view them. Alex Benzer and Charlotte Genevier, two college-aged software entrepreneurs hailing from Webligo, a budding Pasadena-based company specializing in web-based software development, have released a new social networking platform called SocialEngine. The aim is straighforward: to give individual webmasters and small organizations a comprehensive yet simple way to build social networks. SocialEngine is a PHP-based white-label social network platform that installs a full-featured social network on your website. Like other products, it includes most of today’s popular features such as blogs, photo and video albums, interest groups, and so forth. What makes SocialEngine unique is its unprecedented extensibility and customizability. While other products give you cookie-cutter designs and an overwhelming mound of features for users, SocialEngine offers simplicity, ease of use, and complete control over the appearance and functionality of your social network. The developers designed SocialEngine to highlight your unique concept instead of the platform itself. In that vein, SocialEngine is the only product of its kind that does not force any copyright statements or branding on the visible areas of your social network. Another unique aspect of SocialEngine is its capability to have “subnetworks.” SocialEngine automatically sorts your users into these subnetworks depending on the rules you (the administrator) have set. For example, you can organize users by age, location, profession, university, and so forth. Smart administrators will use this feature to show highly-targeted advertisements to their users, generating above-average advertising returns.